High Country Villas in Encinitas, CA is ideally situated near San Diego and only three miles from the ocean. This 546-home active adult community is spread across 12 acres and features beautiful villas, a 9-hole golf course, gorgeous views and an abundance of leisure and social activities designed for active individuals. Active adults in the San Diego area will love the open floor plans and wonderful amenities at High Country Villas. High Country Villas was built between 1973 to 1985 and has a selection of one-story attached homes and two-story condominium homes. The single-story homes in High Country Villas are 55+ while the two-story condominium homes are a part of the non age-restricted neighborhood of Country View located within the High Country Villas community. Both sections of the community share the community amenities. At High Country Villas, residents have a variety of enjoyable amenities right outside their front door. At the center of the community is the beautiful clubhouse where residents attend events, stay in-shape, or simply relax with their neighbors. Indoors, residents can challenge each other to a game of pool or lounge with book from the clubhouse's library. There is also a large great room with a covered patio for community get-togethers or catching up with friends. The desirable amenities continue outdoors. High Country Villas' residents have access to the beautiful rolling 9-hole golf course for getting in a quick round. Golfers will also love the community driving range and putting green for honing their game. The community's two swimming pools and outdoor spa are a favorite hangout where friends and neighbors bath in the warm sun or cool off in the lovely year-round Southern California climate. Active adults will have plenty of opportunities to practice their favorite sports or try a new one at the bocce ball and shuffleboard courts or the horseshoe pits. High Country Villas also has a charming gazebo for quiet nights with your spouse or for community parties. High Country Villas offers single-level homes that range in size from 884 to 1,056 square feet. There are age-restricted one-story attached homes or non age-restricted two-story condominium units in the Country View neighborhood. Smaller units include two bedrooms and one bathroom and the larger units have three bedrooms and two bathrooms. In the Country View neighborhood, home buyers can choose from either ground level units with patios or second floor units with balconies. All homes include a detached one-car garage with additional parking available for guests. High Country Villas provides active adults with plenty of opportunities to stay physically, socially and mentally active. Creative-minded residents will love the art and book club or the knitting group for making gifts for the grandchildren. Stay in-shape with your neighbors with water aerobics or yoga. Meet new neighbors with regular happy hours and Sunday chats. Active adults will also have plenty of time to explore their hobbies and interests because of a homeowners' association (HOA) fee that includes exterior maintenance of the buildings. High County Villas enjoys a near perfect climate where warm inland temperatures mix with cool ocean breezes. The community is only 25 miles north of San Diego and three miles from the beaches of the Pacific Ocean. Interstate 5 is only two miles from the community and provides easy access to downtown San Diego and other popular North San Diego County destinations. A variety of great shopping and moderately-priced restaurants surround the area including the Old Encinitas Historic Downtown District filled with boutique shops and wireless cafes. 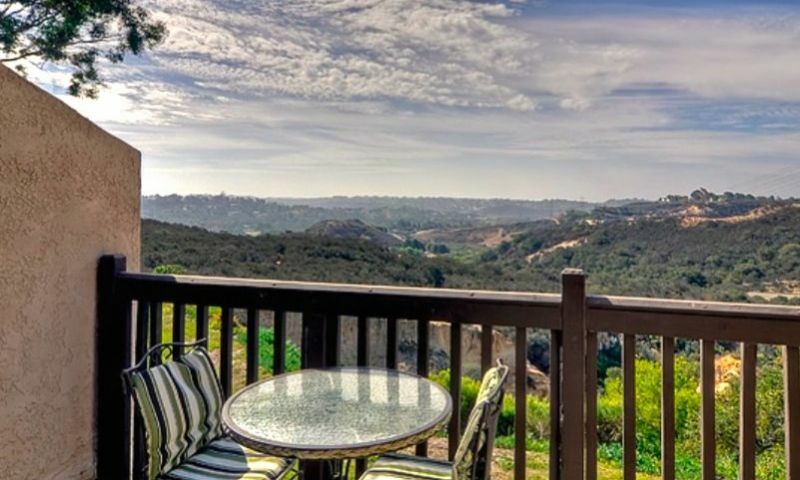 Combine all this with the scenic Highway 101 offering breathtaking coastal views, majestic sunsets and miles of sandy beaches and it is easy to understand what has made High Country Villas such a popular retirement community for active adults in Encinitas, California. Residents have access to a 9-hole golf course and golf practicing facilities. There are plenty of activities available in High Country Villas. Here is a sample of some of the clubs, activities and classes offered here. There are a select number of two-story condominium units available to residents of all ages. These homes range in size from 884 to 1,056 square feet and come with two or three bedrooms, one or two bathrooms, and a detached one-car garage. The upper units have balconies while the lower units have patios. Please Note: Due to the age of this community, floor plans are not available. High Country Villas features single-level attached homes that are for residents 55 and better. These homes range in size from 884 to 1,056 square feet. Homes include two to three bedrooms and one or two bathrooms and most homes feature a one-car detached garage. Additional parking is available for guests. The community was developed between 1973 to 1985. Please Note: Due to the age of this community, floor plans are not available. This place is a friendly little community a stone's throw from the ocean. Very quiet, relaxed and good people live here. We prefer to spend our time outdoors at the pool or walking the trails. We like our neighbors here and felt welcome from the first day we moved in. 55places.com is not affiliated with the developer(s) or homeowners association of High Country Villas. The information you submit is distributed to a 55places.com Partner Agent, who is a licensed real estate agent. The information regarding High Country Villas has not been verified or approved by the developer or homeowners association. Please verify all information prior to purchasing. 55places.com is not responsible for any errors regarding the information displayed on this website.